Since launching a few years ago, Prevelo has taken the kids’ bike world by storm. Their popularity has been particularly evident amongst the mountain bike community which explains the release of their revamped Zulu line. Expanding on the original Zulu line, the new offerings include a teeny-tiny 14″ bike with disc brakes and 16″, 20″, and 24″ front-suspension mountain bikes with improved geometry and component builds. We got a first peak of the new Zulu bikes at Sea Otter this past April and recently got to test the 20″ Zulu Three for several weeks of riding. 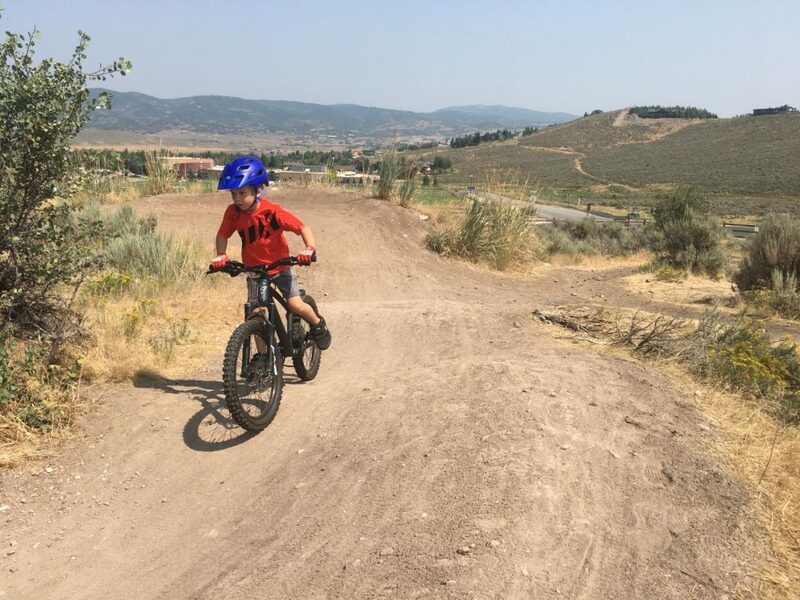 During that time, we took it on lift-served downhill trails, cross-country trails, and the Trailside bike park in Park City, UT. Familiar with the quality of the Prevelo bikes, we expected the Zulu Three to perform and it did. It shined on downhill trails and technical terrain, and along with the rest of the Zulu line, is worth a look for any family that is serious about mountain biking. 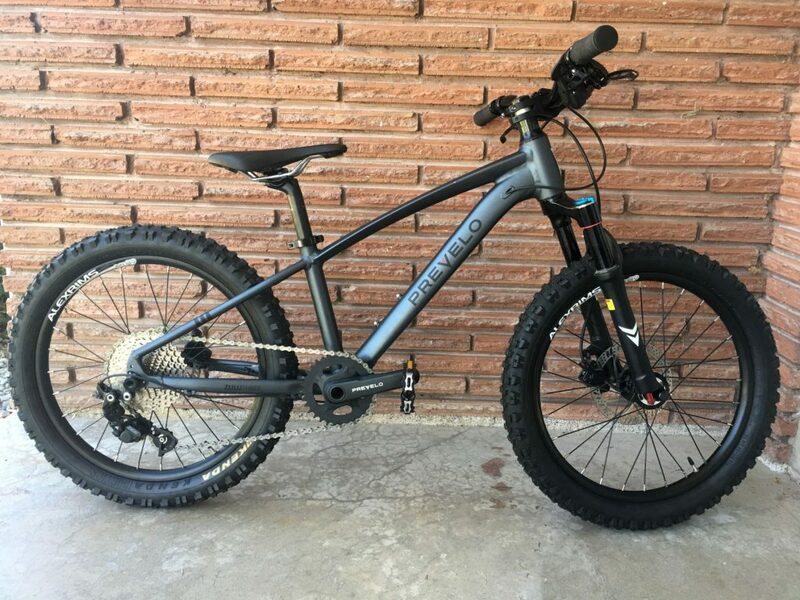 There aren’t a ton of options for sub-26″ mountain bikes, and the existing options tend to fall into two categories: (1) heavy, sub-par offerings from the big-name bike manufacturers (Specialized, Trek, etc), and (2) boutique mountain bikes that tend to cost an arm an a leg (Trailcraft, Flow Bikes, etc). The Zulu hits a sweet spot in between. Here are pint-sized mountain bikes that offer decent components, respectable weights, and are financially realistic for bikes that are going to be outgrown in a year or two or three. The Zulu One is the ONLY 14″ mountain bike we know of with hydraulic disc brakes. It also has beefy 2.1 inch tires and weighs in at a respectable 16 pounds. If you want to start your child on the trail early, this is one of your best options (if not THE best). A 16″ bike with a quality suspension fork? Yup, it’s for real. The Zulu Two HEIR has an air fork with 60mm of travel, adjustable rebound, and lockout. Don’t feel like you need suspension at this age? That’s cool too because the bike will also be offered with a rigid fork. This is one of the best 20″ mountain bikes available. With the HEIR fork, the bike weighs only 22 pounds, has Tektro Hydraulic disc brakes, and a Shimano ZEE 10-speed drivetrain. For more reasons why we love this bike, read our review below. 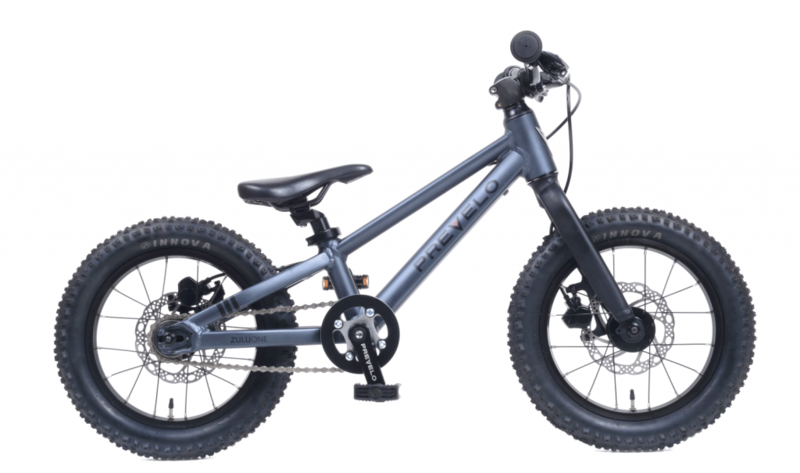 Kiddo not quite big enough for a 26″ mountain bike yet? No worries, the Prevelo Zulu Four has adult-bike quality in a kid-sized package. 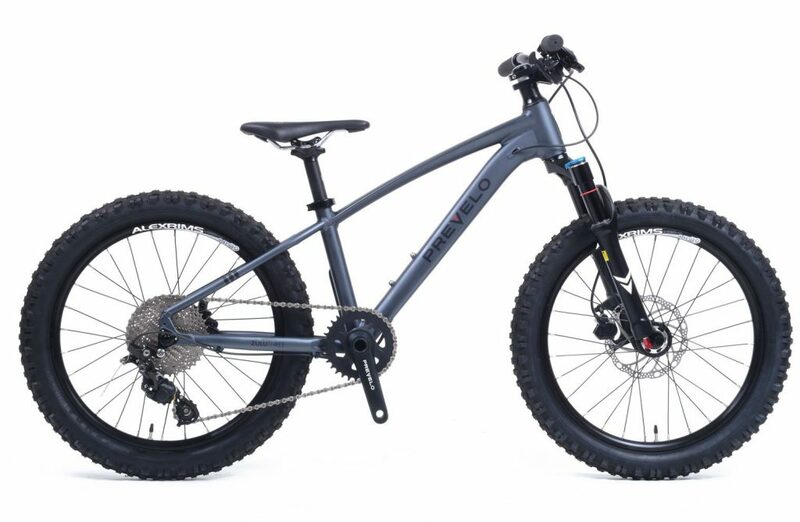 This HEIR version offers 80mm of travel with adjustable rebound, lockout and compression, as well as well as Tektro hydraulic disc brakes and your choice of Shimano drivetrain. The Zulu Three that we tested was a pre-production version with slightly different specs than what is now offered on the production model. For that reason, I’ll talk more about the overall ride quality rather than individual specs or components. But be assured, the final production model is even nicer than the Zulu that we tested. For our first full day of testing, we took the Zulu Three to the Grand Targhee bike park for some lift-accessed downhill runs. We’d just been to Whistler where my son rode the full-suspension Spawn Rokkusuta, and quite frankly, I didn’t think that Prevelo Zulu would be able to compare for bike-park riding. But amazingly, it did. 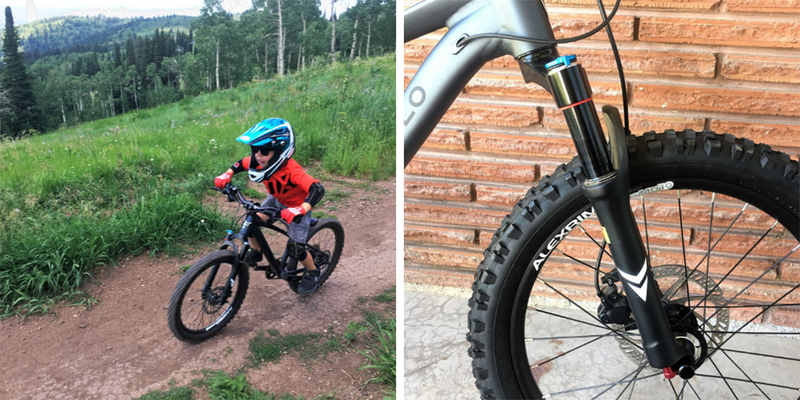 While not necessarily designed for downhill riding, we found the Prevelo Zulu Three offered plenty of travel for a 5.5-year-old tackling medium-sized drops and jumps on green and blue trails. 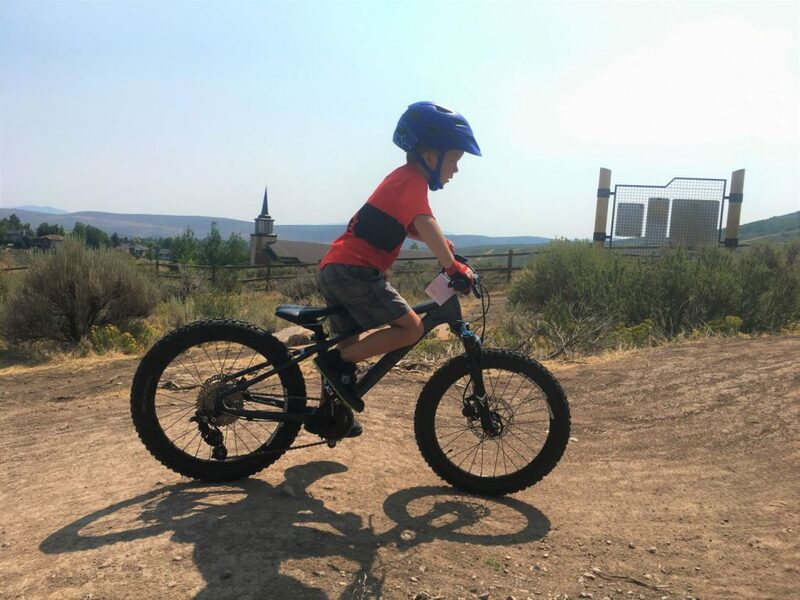 For kids going HUGE or who are ready to be introduced to true black trails, you might want to consider a full-suspension bike, but for the majority of kids at this age, the Prevelo Zulu offers plenty of squish. The Zulu Three HEIR model offers an 80mm air fork with adjustable rebound, lockout, and compression. 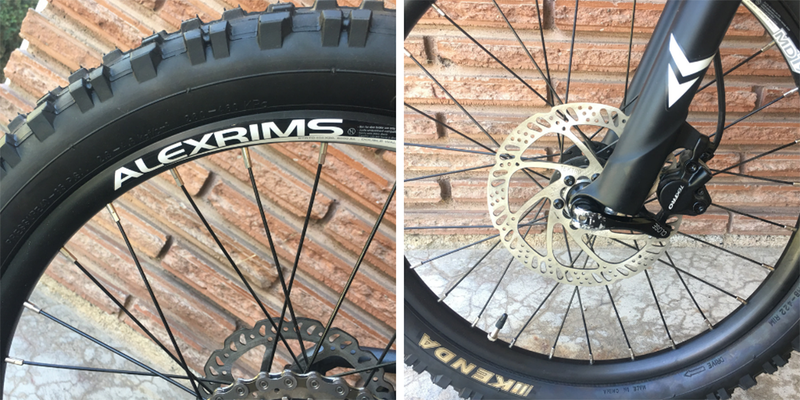 Compared to his other 20 inch bikes without suspension, we found that having a suspension fork really did make a huge difference. He was able to ride longer without shaking out his hands and rode faster thru technical sections. If you are a family that does REAL mountain biking, upgrading to a suspension fork is worthwhile. The difference in comfort on technical and rocky trails was noticeable for my son who usually mountain bikes on his Prevelo Alpha Three. 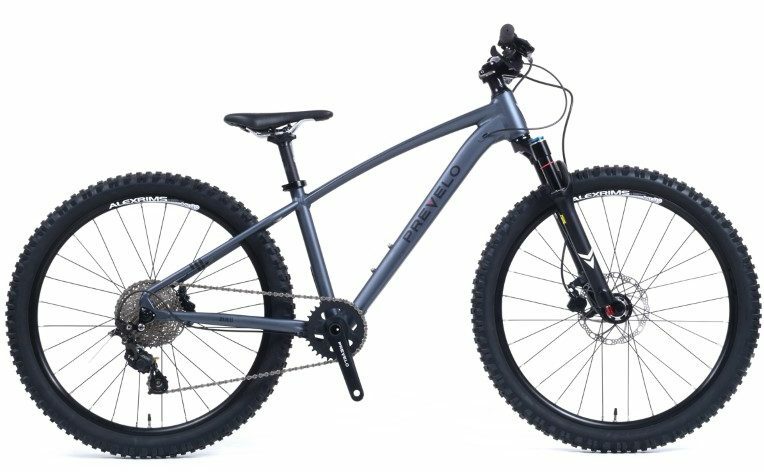 Although the Alpha Three offers plenty of benefits (more on that in a second), it is clear that the Zulu is better suited to real mountain biking. In addition to the suspension fork, the BEEFY tires made a huge difference in his comfort level and ability to master tricky section of singletrack. The 2.35 tires Kenda Kinnetic tires are basically the equivalent of plus-sized tires on an adult bike. Compared to rim brakes, the Tektro hydraulic disc brakes also make a big difference on steep terrain. While these brakes don’t offer the same stopping power or modulation of higher-end brake systems, they do a good job for lightweight riders. My son didn’t love the existing brake levers–but those will be changed out on the production model. Overall, the disc brakes on the entire Zulu line will be one of the biggest differentiators between these bikes and other kids bike offerings not intended for true mountain biking. The only improvement we could come up with was the weight. While the bike shined on downhills and technical sections of trail, when things turned upward, it was obvious that the Zulu weighs significantly more than the Alpha Three. For longer trail rides (over 5 miles) and sustained uphills, smaller and lighter kids will struggle. My son was noticeably slower and tired sooner on the Zulu Three than on the lighter weight Alpha Three. That said, the production HEIR model tips the scales at a respectable 22.2 pounds. That’s heavier than the super lightweight Trailcraft Blue Sky 20, but it’s also several hundred dollars cheaper. Seems like a fair trade off without a significant weight penalty. The Prevelo Zulu line offers real mountain bikes for young riders. In the 14″ and 16″ categories, the Zulu is basically revolutionary. No longer do young children have to make do with hybrid bikes for riding on singletrack. 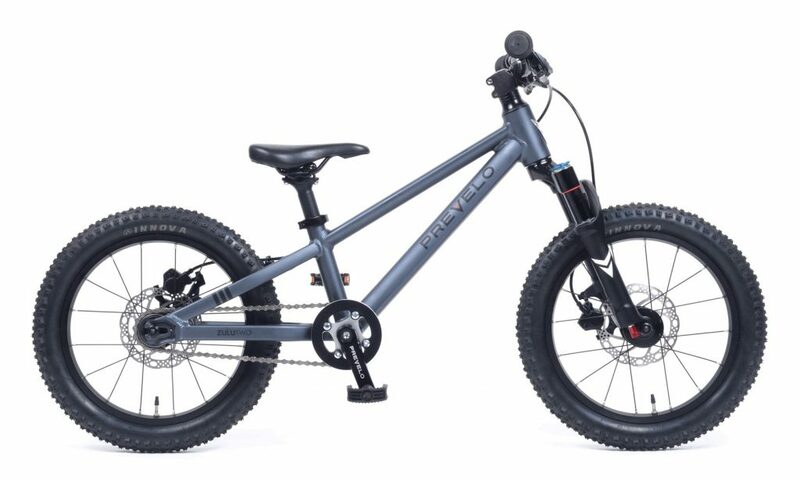 In the 20″ and 24″ categories, the Prevelo Zulu offers a mid-range mountain bike that offers lower weights and nicer components than many of the big bike manufacturers and more affordable prices than most of the kids’ mountain bike boutique brands. Wondering what else is out there for young mountain bikers? We’ve rounded up what we consider the best kids mountain bikes out there (including the Prevelo Zulu).